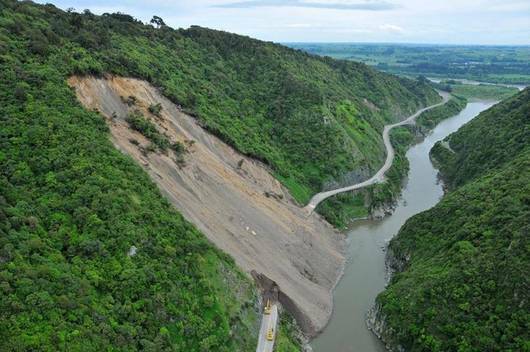 Being a Manawatu kid (having grown up in Palmerston North) the editor couldn't help himself but include this impressive and disturbing photograph of a massive slip across SH3 through the Manawatu Gorge between Palmerston North and Pahiatua. The first slip on August 18 closed the road and it has been closed ever since as Higgins contractors work to clear the estimated 80,000 cubic metres of slip material. The clean up and associated costs are expected to be as much as $10 million. After returning from fishing the Mangatainoka River (no, he wasn't in search of the Tui brewery girls – they hadn't been invented in those days), the editor sometimes used this road for the return cycle home – luckily this never happened then. The Tararua District Council on its website describes the status of the road as: CLOSED UNTIL FURTHER NOTICE.